Giving the SoW Waterloo scenario creation scene a twirl this weekend. This one pits us humans as the French in a desperate battle to save Napoleon's right flank at Plancenoit. Full briefing below. Personally, I think this one's got Kevin's name tattooed all over it as French CinC Lobau -- a guy fate has unkindly placed in position to make at least one history-changing, gut-wrenching decision. The Prussians: Following the debacle at Ligny, III Corps chief of staff Carl von Clausewitz successfully lobbied both Blücher and immediate superior Johann von Thielmann. Much to von Gneisenau's dismay, the Ancient One has ordered a reinforced III Corps, after resting and licking its wounds in the woods a few miles north of Ligny at Villers-la-Ville, to march directly toward Wellington's position at Mont St. Jean. The remainder of the army retires on Wavre. Blücher is convinced that this movement will demonstrate Prussian support and resolve to his friend, the Duke, more forcefully than any words . Following this directive, the III Corps Prussians have been on the march since early morning. The French: Napoleon has had sketchy advance warning of the Prussian movement, though notably not from Grouchy (who is happily chasing phantoms from his strawberry field at Walhain). Instead, the Emperor has heard from a sympathetic Charmes villager, who tells of a large force of Prussians on the march from the southeast. Other locals have confirmed variations of this tale, though there is some confusion as to whether the direction of the Prussian approach is southeast -- or south -- or east. In any event, Napoleon cannot ignore the risk presented to his right flank. *The Young Guard Division is considered committed at any point if it takes in excess of 300 casualties. It may be ordered into battle early, even immediately, but doing so sacrifices any chance at strategic/decisive victory. In any event a decision whether or not to commit must be made by 16:30/4:30pm. 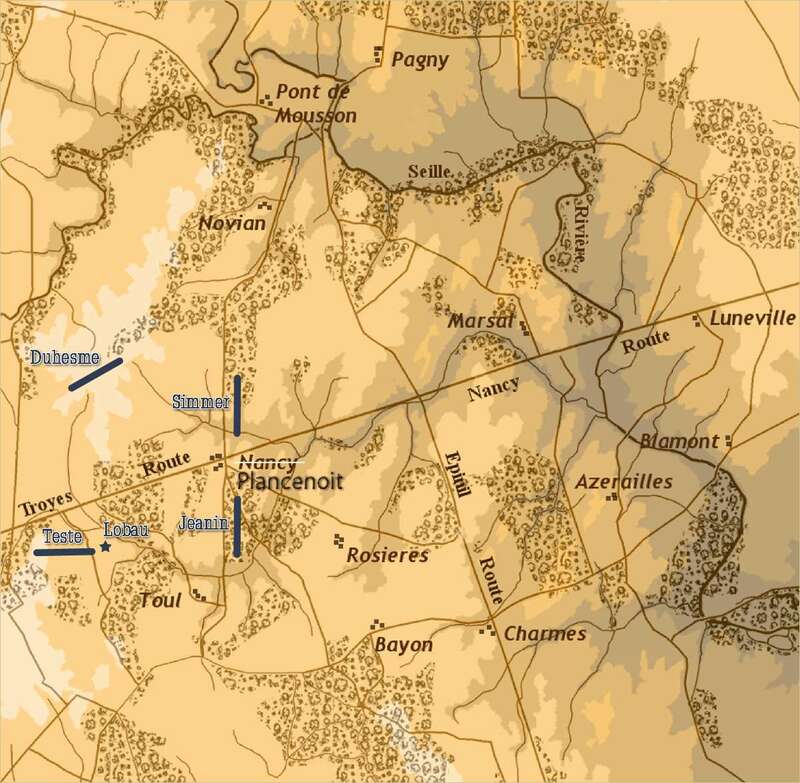 To remain uncommitted (and therefore available to Napoleon), Duhesme must receive an order to march his entire division toward the northwest corner of the map by that time. Once the order is given, the Young Guard may not be recalled to the battle. Those stinking sausage eaters will not survive the day. They will regret their decision not to slink back to Berlin. the only thing better than killing Frogs is killing Prussians... hope I will be around - not sure though - I'll be in the Italian Alps most of next week - going to visit a few of the sites of trench warfare in WW1 in the Alps still visible today! Just one question - why didn't you use the Waterloo map? The Waterloo maps place Plancenoit too close to the map edge for my purposes. As a result of this, or perhaps the differences in the road net, it was difficult to get the AI to act in a reasonable manner. It is rumored that the Prussians have a rather large baggage train with them. Such a prize will justify nearly any risk taken. I will expect my division commanders to perform their duty accordingly. Prussian silver? General Georgia might be better off surreptitiously knocking over the Emperor's baggage train -- after either a victory or defeat -- and blaming it on the Prussians either way. This one's going to be a classic case of quality vs quantity. We'll see whether these Frenchmen are able to live up to their reputation. But I'm itching for some P v P action. I feel a Duh moment coming but what is the name of the map please? It should be France Manassas. No it is a free add-on to GB, you just need the 3 KS mods to play. so why did you say that you didn't have that game then? Without owning these GB add-ons the maps in WL will give you errors. All the freebie GB add-on maps have their lsl files included in the KS maps mod. Sunday, all you'll need is the 3 standard KS Waterloo II mods to play. Before the game, I'll post a link to download & unzip a special folder to SoW WL Mods. Prepare to deal with the AI Prussian onslaught! Will Kevin/Lobau be forced to commit the Young Guard to save the Emperor's right? Will his division commanders be able to hold the town? And, most importantly, will Gen. Georgia score a wagon load of Prussian -- or even Belgian or French -- silverware? So many questions... Don't miss it! The 1st priority will be the Prussian baggage train. The 2nd will be the Emperor's. Once the important objectives are secured, we'll worry about the town. I would like to give it another go. Last Sunday I kept getting dropped, so I reconfigured a few things on my network (assuming it was that). By all means join us. It may be best if you take a brigade command in case you drop again. I'll try to be there - but no promises.... all depends on how many Germans decide to take the same motorway I have to in order to get back home tonight before the game starts! Ron, what type of cavalry does Lobau have? Does he have dragoons or light cavalry that can be used for scouting?